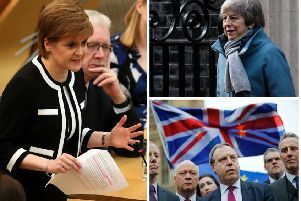 SCOTTISH businesses would face an “export tax” of £2.2 billion in the event of a Brexit vote, Remain campaigners have claimed. Research by Stronger In found the average business exporting to the European Union (EU) would face additional costs of £79,500 in “non-tariff” trade barriers if the UK voted to leave the single market. The campaign group claims extra red tape would include having to submit customs declarations, wait for products to clear inspections and the need to adapt products to different standards. There are 27,330 Scottish businesses that export to the EU, meaning a total additional burden across Scotland of an estimated £2.2 billion, the research said. The report found Scotland has a total of 21,100 financial services jobs, 25,490 professional services positions and 13,810 agricultural employees linked to EU exports. Matthew Anderson, of Scotland Stronger In Europe, said: “It’s clear that the European single market is of huge value to the Scottish economy - it is one of the major gains of our EU membership - and we simply cannot afford to lose it. “Leaving the single market would mean more barriers to trade through new tariffs and bureaucracy, hitting local businesses with tens of thousands of pounds worth of extra costs, and some £2.2 billion to the Scottish economy as a whole. “The Leave campaign have no solution to this - as they themselves say, they ‘just don’t know’. Tom Harris, director of Scottish Vote Leave, dismissed the report as “scaremongering”. “Leaving the European Union does not mean trade will stop,” he said. “We would still have free trade with the continent and many nations not in the EU trade freely in Europe. “David Cameron is trying to scare voters into backing remain as he wants to distract from the real risks of remaining. Scotland would be on the hook for more eurozone bailouts, we will continue to send at least £30million a week to Brussels, enough to hire 1,400 new nurses, and we will have no control over our borders.